The tale is set in 1930’s Europe, and shows us the lives, loves, fear, passions, and prejudices that effected and informed the lives of peoples who were impacted so greatly by Nazi Germany. Jew and Catholic alike, even Lutheran, no one was immune to the social implications of policies gaining traction at that time. The themes the author chose to addressed, from classism and anti-Semitism to religious bias, mental illness, and sexual orientation, were all well presented in plot, and nothing felt forced or even slightly out of place. I was, and still am amazed at the quality of craftsmanship shown in the storytelling. I expected a work of fiction. This was a work of art. This was not reading a book. This was experiencing literature… It makes excellent and proper use of language… sit back and let the story educate and enlighten your mind as well as entertain…as it were a classic work, only discovered and released in the modern age. …Ethnic disrespect, hate, and violence have gone on for centuries in central and eastern Europe. Until reading this book, though, I did not understand how finely differentiated these forces were. Indirectly, the book also helped me to better understand how the dark side of nationality has wiped out countless human beings during various periods …. The author depicts how nearly impossible it is for the characters of this saga to avoid the propaganda machines around them, the pressures to conform, often in a chameleon fashion due to sudden changes in governance, and most unfortunately, the programming in ethnic bias from the time they were children. Despite the serious subjects, there is much warmth in this story. Some of the characters do find ways to stay true to the best in their natures or even redeem themselves, just as real individuals did then, and have always done on the plains of human existence. … well drawn characters … diversity of personalities and the theme of journeys. From ethnic origin to talents and occupations, physical descriptions to sexual preferences, and economic status to political leanings, we see a cross section of humanity…we can appreciate the full range of real outcomes and experiences, happy to sad or shocking, that occurred to real individuals during this era. By the way, the title of the book was an outstanding choice. … Christoph Fischer deftly weaves his tapestry of history and fiction, with a grace … For me, the author’s choice of narrative style brought economy to the complex story being told, as well as a kind of mesmerizing rhythm. This is a story where the reader gets to know the characters and walk with them through the horrors of WWII. … balanced in showing that everyone suffered in a war, that in some cases it brought out the best and the worst in humanity. So it does not limit the story to The Holocaust, but rather brilliantly paints a picture of many aspects and in particular Czechoslovakia. With brilliant stolen moments of joy and human kindness, agonizing moments of human suffering and enough survivors to insure that the tale felt very plausible and believable. Mr. Fischer entertains and informs in a manner that makes the past painful and easy to remember. I recommend this as a historically accurate, emotionally poignant a moving MOST worthwhile read. Christoph Fischer is already blossoming into a great writer in this stunning novel about the Holocaust. 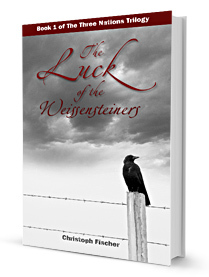 Complex, multi-layered and painstakingly researched, The Luck of the Weissensteiners promises to be a trilogy on a grand scale. And this is no ordinary Holocaust tragedy: it is a much more subtle and far-ranging canvas than that. For Fischer is not dealing with the obvious victims of those troubled times, rather with families and individuals who were more on the periphery and therefore affected in unforeseeable ways. He makes the characters and the frightening and bewildering situations they face come vividly alive. You will find it hard to put down as you follow your favourite characters through one testing situation after another. I thoroughly recommend you read it. Prepare yourself to embark on a journey filled with love, hope, hate, betrayal, intolerance, survival and abuse. Raw reality, an inside of how life was in WW2. Like it always is in real life there is death, sorrow and loss so keep your tissues close. This is a true work of art, and I cannot congratulate Mr. Fischer more on creating this amazing work. Really looking forward on reading the rest of the series. Wow, this book comes with serious credentials. It’s just shrieking out to be bought and read and it’s a privilege to feature it as a Gust Blog on our pages. That’s a great write-up on your own book, Christoph–highly deserved, especially since you do so much to encourage and feature other authors. BRAVO! Acclaim is always good!